Year on year, Ice has successfully created an impactful experiential event for the Co-op Annual Trade Briefing. From the development of the initial concept to delivery, the team at Ice has designed and managed a streamlined and engaging exhibition for suppliers and colleagues, telling the story of the Co-op brand. 2018’s Trade Briefing was no exception as the Ice Events team created an enchanting atmosphere complete with falling snow flakes, adorned fir trees and swathes of alpine archways leading guests into a festive Christmas marketplace. This much anticipated annual event has developed over the past three years so let’s take a look back at how the success of this creative conference has evolved. In 2016, Co-op relaunched their household brand and asked Ice to create a captivating and immersive event highlighting their premium food range; Irresistible. As a yearly conference attended by over 800 partners, the Ice team got straight to work crafting a tempting Festival of Food experience. The exhibition invited guests into a bustling marketplace to explore new and innovative Co-op developments due to be launched instore. The event was complemented by the copywriting, design and production of a 20 page brochure by Ice which revealed the highlights of the day’s proceedings. At the heart of the marketplace was a Central Hub and small theatre where presentations were held on Co-op’s rebrand objectives and business initiatives. 2017 gave way to a very British affair with home grown produce at its core, conjuring up the humming thorough fair of a trendy east London street on market day. Set in the iconic venue of Victoria Warehouse in Manchester, the Ice brief was to reimagine a celebration of the diversity of modern British culture to ignite conversation around the varied range of Co-op’s Irresistible food brand. Insight was taken from the hip street markets of Britain’s capital city, whilst contemporary trends in food culture were employed to create an unparalleled experience designed to entice Trade Briefing guests. An array of exhibition stands conveyed Co-op’s sustainable and ethical values as well as company goals for the coming year. With its local street charm, this festival of British food was the ideal setting for colleagues and trade partners to connect whilst having a community feel and delectable market flavour. This year, a seasonal experience was briefed with an added sprinkling of Christmas magic. Tailored as a Christmas Food Festival, 2018’s conference was reminiscent of European Christmas markets and celebrated a collaboration of cultures uniting in the food markets of Britain. 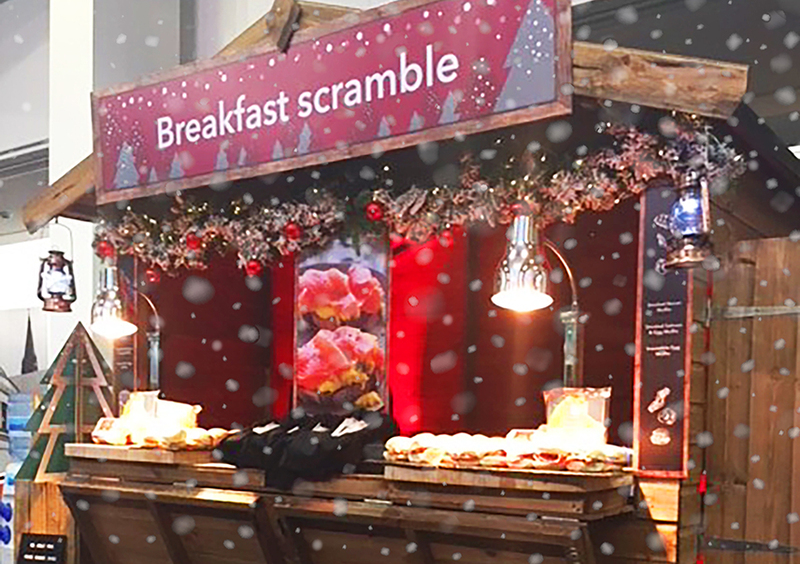 The event acted as a showcase for Co-op’s key campaign of 2018; ‘The Year of Eating Together’ and its primary challenge was to ensure that the venue of Manchester Exchange Hall underwent a transformation from corporate event space to a wintry and festive bazaar. In true Christmas market style, alpine lodges serving confections and hot beverages were festooned in twinkling Christmas lights bringing to life a delightful, seasonal atmosphere. Through the years, Ice has been tasked with taking the guests of the Annual Trade Briefing on a journey with Co-op. From providing support in the repositioning of Co-op in their brand relaunch to discovering the key messaging and hero products of the year. The Ice team has invited Co-op conference guests to network and strengthen their relationships with trade partners as they navigate the tantalising delights of Co-op’s food range, ethics and brand values.